APOD: May 16, 1997 - Signed, "A Black Hole"
Explanation: This artistic image is actually the signature of a supermassive black hole in the center of distant galaxy M84 - based on data recently recorded by Hubble's new Space Telescope Imaging Spectrograph (STIS). Very near black holes the force of gravity is so strong that even light can not escape ... but the presence of a black hole can also be revealed by watching matter fall into it. In fact, material spiraling into a black hole would find its speed increasing at a drastic rate. These extreme velocity increases provide a "signature" of the black hole's presence. 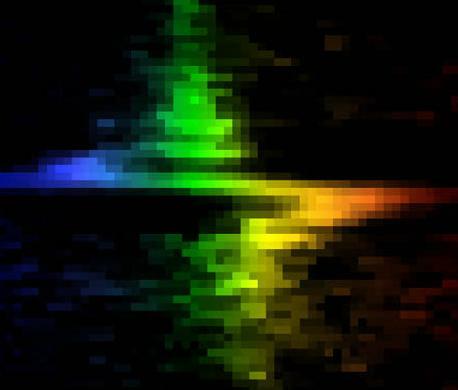 STIS relies on the Doppler effect to measure gas velocity rapidly increasing to nearly 240 miles per second within 26 light years of the center of M84, a galaxy in the Virgo Cluster about 50 million light years away. 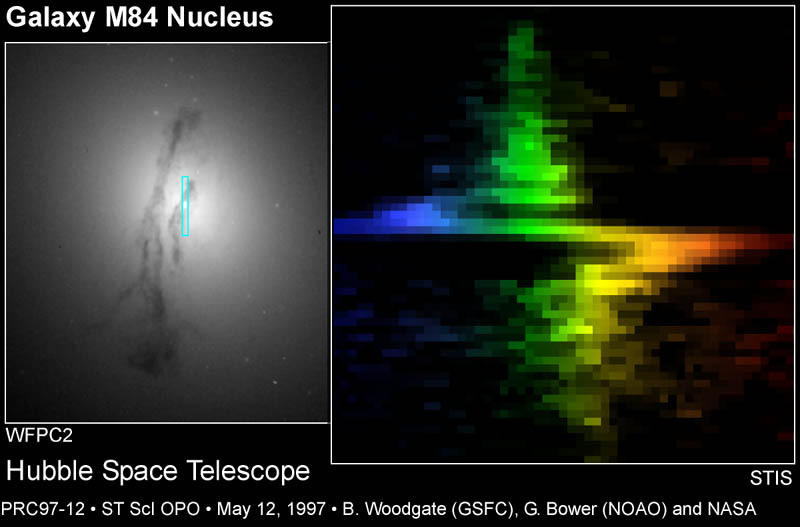 The STIS data show that radiation from approaching gas, shifted to blue wavelengths left of the centerline, is suddenly redshifted to the right of center indicating a rapidly rotating disk of material near the galactic nucleus. The resulting sharp S-shape is effectively the signature of a black hole estimated to contain at least 300 million solar masses. Do all galaxies have central black holes?